I don't think it's necessary to look pretty in life, but sometimes it helps. Dessert is the same. The main meal is done, the wine is finished. Any dessert at all is a bonus. In my house you will be served coffee definitely, dessert maybe. Pretty dessert? Unlikely. And yet, sometimes a pretty dessert is called for. It may be the boss that's over for dinner, or some loved one you want to make something special for. Either way, this dessert is pretty, unexpected, and, most importantly, easy. And very impressive. So, next time when the boss is over for dinner, or you're cooking for somebody important on the third date, remember this one. Wash, hull and half the strawberries. Taste them, and sprinkle with a little bit ofcaster sugar if they're not that sweet. Melt the sugar in a heavy bottomed saucepan until caramelised. Be careful not to burn it. When ready, put the bocconcini in the saucepan and cover with the caramel. Let it harden on some baking paper. 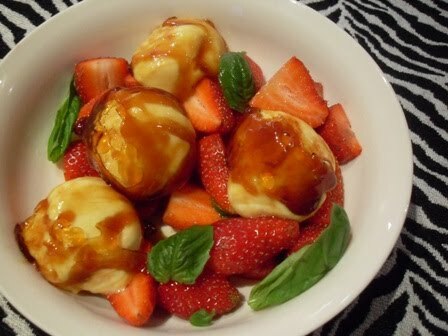 Combine the strawberries, bocconcini and basil in bowls. This is a dessert I will enjoy easting. Simple elegant and very yummy. Thanks Arlette. I hope yours was wonderful too.